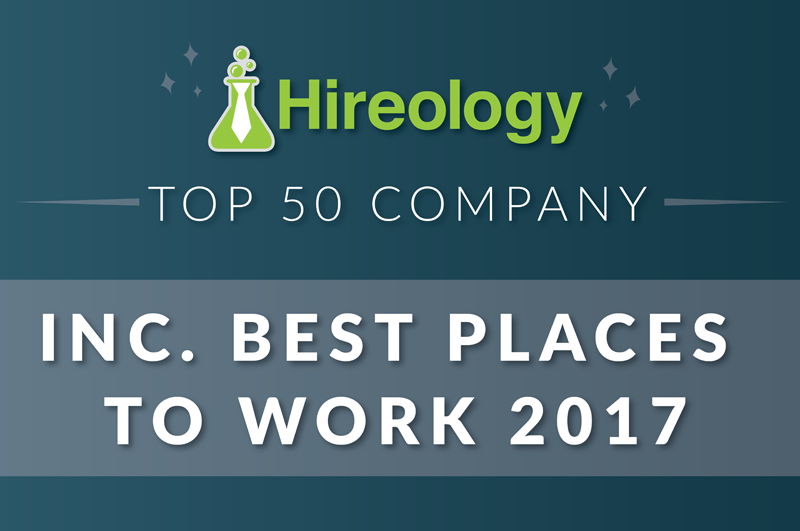 Hireology is excited to announced our recognition as an Inc. Magazine Best Workplace for 2017. The Inc. Best Workplaces Awards assessed applicants based on company benefits and employee responses to a unique, 30-question survey. While researching the entries, Inc. and Quantum saw distinct themes develop, including: strong company cultures breed strong individual and team performance, and when employees feel valued by their organizations, they are far more likely to be engaged. Hireology places a high value on its company culture and employee engagement – centered around the creation of authentic and intentional core values. Its company culture has contributed to strong business growth – over the past year, Hireology’s customer base has expanded by 1,000 clients, driving a 140 percent increase in revenue over 2015. The company also invests in its employees’ health and happiness with a comprehensive benefits package ranging from company-sponsored health plans, retirement planning with match, unlimited paid time off, gym membership and bike ride sharing discounts, student loan financial planning consultants, and tax-free commuter transit benefits. To see the list list of winners, pick up a copy of the June 2017 issue of Inc. Magazine or read the online feature here. Interested in joining the Hireology team? View open positions and apply today. Hireology was additionally named by the National Association For Business Resources as one of the Best and Brightest Companies to Work For® in Chicago. It is the second year in a row Hireology has received this honor. An awards ceremony to honor the winning companies and human resources symposium will be held Monday, July 17, 2017 to celebrate the winning companies.